Apparently, there is no quality problem with the 1145 itself. It's all just bad attenuation / level adjustment by SEGA. I'd like to build this myself, but there are no details from Voultar yet. I'll be putting this on OSHPark, soon. Everyone will get to use it. There's two parts. We have addressed coupling between the high speed stuff (sub-carrier) but now we need to polish out a clean & easy way to deal with address line coupling. Some systems have it, other systems don't. Methods vary between SMS and Genesis. When I look for board revision photos online, all I can find are general top-down views that don't show the underside detail like this. I had some success with copper foil tape over the memory bus traces. It's not nearly enough though. The subcarrier line had to be routed via bodge wire, away from the RGB. Maybe your PCB approach is best. If you want to try Vcc filtering, maybe try adding a well designed Pi filter on the board. There are analog Vcc and Ground pins on the VDP but I don't know if those are internally connected to the other power pins or not. For what it's worth, isolating analog Vcc on the 1Chip SNES CPU-N worked wonders! All that was needed was a small series resistor there! Your traceout is really nice. You can mark all the lower right section as no-man's-land though. It's a perfect storm of memory bus switching noise over there, and it's right next to the RGB..
That's off-topic but how did you get rid of your MD2's jailblars? Are issues with RGB jailbars on Genesis still a thing? I haven't tried it on a Genesis model 1, but I was able to eliminate the jailbars on RGB on a model 2 that had a Sony video encoder (CXA1145 I think). My recollection is on the AV connector the pin for csync (most cables use composite video for sync) is connected to the sync input pin of the video encoder. This did not give me a usable sync signal on any of my equipment, so I cut the trace. Then connected the sync output pin of the video encoder to a 220uF capacitor, then a 75 ohm resistor, then connected that to the csync output pin on the AV port. That gave me proper csync and it had no jailbars. The RGB signals themselves were never modded/bypassed/etc. I assume the AV port's sync pin is #5? Not sure my two scart cables are identical though, gotta check asap. So the age old problem still persists. I use a model 1 VA6 revision, and that had very pronounced jailbars on it prior to modding. I have since installed a similar bypass mod to ArcadeTV's one, except with a THS7374 instead. Board was designed by Zeruel85. I had to lift the pins on the VDP and tap the RGB signals direct from there to get the most jailbar reduction, but even with doing that, jailbars are still present albeit much fainter. I wonder if it might be worth connecting the VCC and AVCC pins on the VDP directly to the voltage regulator, as that is what I had to do with the bypass board in order to get an interference-free image as the 5V rail seems to pick up noise from somewhere. One thing of note, though, is the jailbars are only really obvious when using either 320x224 or 256x224 optimised modes on the OSSC, and that is likely to do with the scaling taking any ringing artifacts and turning them into actual coloured pixels - something I have noticed when using those optimised modes, high contrast edges tend to have ringing on the right hand side that causes discolouration in adjacent pixels. So what's the verdict on model 2s? Do they also route the sub carrier trace along side the blue? 2.) I have no idea if it will work correctly on the Fujitsu video encoder since I've never tried it on one. I also don't know if the 220uf cap and 75ohm resistor are the correct components for it either. 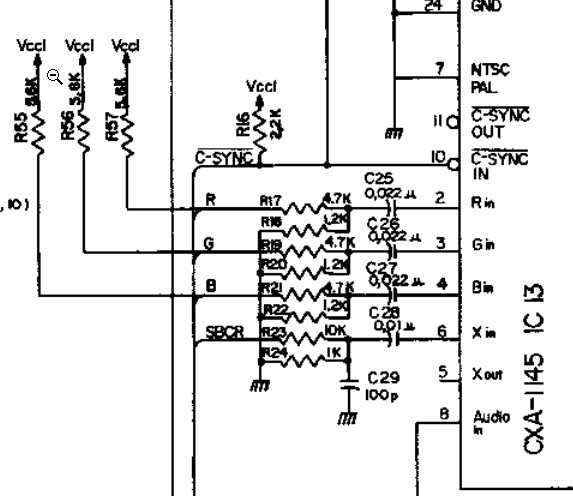 If i recall, those were the components shown in the Sony CXA1145 datasheet for the sync output circuit. 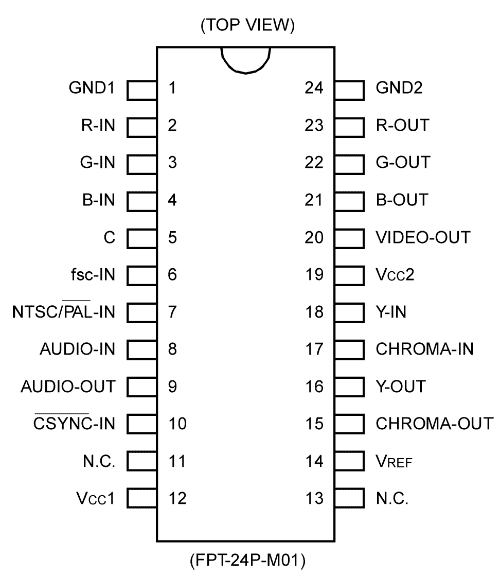 I don't know if a datasheet is easily findable for the Fujitsu encoder to see if it's the same. In theory csync should work if the components are correct, but I don't know if it'll help the jailbars or not with that video encoder. Also as a side note, I don't know if the advice I gave for the Sony encoder makes it output TTL level csync or 75ohm terminated (if I got that terminology correct). That was back before everyone became aware of the differences and pitfalls, and my Extron Crosspoint switch just makes all it's sync outputs TTL and I adjust them with a resistor from there instead of going back to all of my consoles to figure it out . Fujitsu video encoder does not have sync out, IIRC. I just ordered in a few of these CXA chips to replace the crappy Fujitsu in my MD2 for like $3 off ebay. I think its the same footprint and you just remove a capacitor and add a resistor, just haven't figured out the missing resistor value yet. Oh and just as an aside, another thing I noticed with my model 1 VA6 is the jailbars get worse the longer the console has been switched on. It's had new voltage regulators and everything, so, no idea. Honestly this is beyond my soldering skills. cr4zymanz0r's mod seemed doable at my level but replacing the whole chip is too much, it's too small, I don't have the eyes for this, no precise-enough tools either, so nope. I just now cut the trace to pin 50 on my VA3 Model 1 Genesis and the jailbars are like 90 percent gone. I also recapped the system recently so maybe that helped too. Hi, so what is the best solution for the mega drive today??? last year there were 4 upcoming boards, but I can't find them, did they sold out?? or maybe they haven't been release yet?? I'm fairly certain that since I originally posted this thread there hasn't been any other boards released or made public. In my case, lifting pin 50 on the VDP significantly helped with the jailbars, along with a full electrolytic capacitor replacement. It didn't remove 100% of them however, maybe closer to 85/90%. I'm waiting on Rene from db Electronics to finish his board and make it available, I'd imagine that's probably the best path for you to take also. There's other boards out there by Arcade TV (I think), but they use older THS7314 amps which apply a low pass filter to the signal and are not as sharp as newer THS7374 chips. Maybe try the VDP pin 50 for now and see if that satisfies you? Rather than lifting the actual pin itself, check to see if pin 50 runs to a component like a resistor that you could remove instead, as this would make restoring the mod much easier. zeruel85 does a 7374 RGB bypass amp. He's out of stock right now but it couldn't hurt asking him. Thanks for this, I didn't realise! Do you know if his work is good and legit? Correct attenuation and voltage levels etc? I'd be interested in the Mega Amp Pro and RGBMD boards. Thanks for the info, will look into it while waiting for db Electronics's solution. I back him and his products 100% Super nice guy to deal with too. Just thought I would chime in here. Lifting pin 50, and performing an RGB bypass, are often times themselves still not enough to completely eliminate the jailbar effect. It all really depends on the dice roll when you get a Mega Drive; some units are worse than others, even individual units of the same board revision can exhibit varying degrees of aliasing. I have a VA4 model 1, and I was fairly lucky in that particular unit wasn't overly heavy on the jailbars to begin with, and I managed to mitigate them to almost disappearing by lifting pin 50, performing an RGB bypass, and adding some decoupling caps on both sets of analogue and digital VCC on the VDP. I'm pretty happy with the results, but, the jailbars still remain, albeit very faintly. I agree. I have two different MD1 boards, and I've never been able to completely remove the jailbars from either of them. I've even tried bypassing the CXA1145 using ArcadeTV's board, but that didn't make much difference, and for some reason they made column 7 and 8 of the 240p test suite colour pattern look indistinguishable, so I removed them again. If you're using the OSSC the phase value can have a noticeable difference in how bad the jailbars show up, especially in 256x240p optimal mode, where the jailbars appear much more noticeable for some reason. I was actually thinking about the bypass caps on the VDP last night. Did you increase the value of the ones already on the board? (C16, C17 and C18 if I remember correctly). Or did you add some in parallel? And did you see a difference doing that? It's not that it filters the jailbars out, but it features individual potentiometers for RGB, meaning you can balance the levels manually until the bars are gone from all color layers. Though it is VERY difficult to achieve since the potis are insanely sensitive and old/corroded. Plus the right levels will be different depending on the source game and console. Experimenting this I've been wondering if ultimately the solution for all MDs could be similar to this: tweaking levels separately with whatever adjustable amp and saving a few profiles. I haven't tried this with the OSSC yet but I have a feeling it won't be the same. 1000000% this. The ArcadeTV bypass board also made columns 7 and 8 of the colour test pattern on the 240p test suite indistinguishable, and the reason for that is ArcadeTV's board is missing components to show the colours at the correct levels, making them appear too dark. You need to add a 5k6 ohm resistor on each colour line before they enter any of the components on the bypass board, and attach them all to 5V to pull them up. 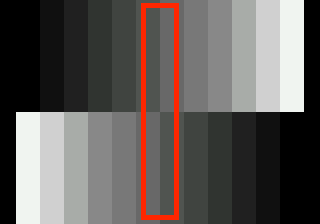 This will show the colours at the correct levels. I think they are missing on ArcadeTV's board because I believe his original intention was not to isolate the colour lines, and simply connect the board in parallel, because the pull up resistors are already present on the motherboard. The Mega Drive's 5V line is notoriously noisy, however, so I added my own resistors and connected them to the 5V supply on the bypass board, which taps its supply directly from the 7805 to avoid noise. I didn't bother removing the other bypass caps, I just added another 100nf cap on each in parallel to the existing ones. It has made a difference in my opinion - correct me if I'm wrong but although there are decoupling caps already present on the analogue lines, I couldn't find them on the digital VCC and GND, so perhaps those are the ones that made the most difference. I totally agree with you on the OSSC front, you can completely hide the jailbars in 256x224 optimised mode, but you need to have the picture slightly out of phase to do so. Because the optimal sampling rate of the Mega Drive for 320x224 optimised mode is 427.5 and therefore cannot be selected on the OSSC, you tend to get jailbars more on one side of the screen than the other, depending on whether you opted for 427 or 428, and your phase adjustment. So I see Voultar just featured my previous comment on a video he shared via his Twitter. My explanation for why it happens might well have been off, but the results speak for themselves, being that the colours appear correctly only when those pull-ups are present. Otherwise, everything is too dark. He seems to be under the impression that those pull ups have no effect on the signal's amplitude whatsoever, when they demonstrably do, as evidence by the difference witnessed between them being there and not being there. If there was no effect, then there would be no difference in colours, but the fact is, there is. Lifting pin 50 on the VDP itself for me fixed the jailbars on both my Genesis and Mega Drive (PAL) model 1. Umm the 5.6k pull ups are part of the original video circuit.. I've never had an issue with my bypass mods because I solder my input leads to said resistors. I tried replacing C16, C17 and C18 with 100nF ceramic 0805 capacitors today. This did have an impact on the jailbars, but it's not any better. Yep, better bypassing is not very effective on these boards. Something odd is going on with AVCC. I tried cutting the trace that feeds it and supplying power from the regulator. Noise on the line dropped just a little, not nearly as much as it should. The RGB is still noisy when it leaves the VDP and also instantly picks up all the memory bus switching noise when going to the encoder. Maybe my AVCC isolation didn't go far enough. I haven't bothered to isolate AGND nor the VCC and GND that is used in the RGB attenuation before the encoder. 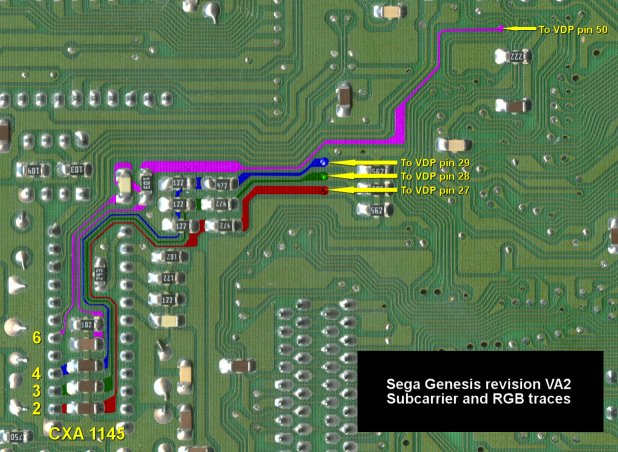 Got to hand it to SEGA though, placing the analog video smack in the middle of the memory bus, that's just impressive.